There was a time when deciding which Belgian hitman you preferred out of Christian Benteke and Romelu Lukaku was a balanced debate. Now, while Lukaku returns to form for Manchester United, Benteke is set for another few weeks on the sidelines. He's an absent presence at Crystal Palace - whether he's in the treatment room or on the pitch. He was a boisterous forward, capable of bashing shots with a thrilling disdain for opponents' safety and heading limestone boulders into the top corner. Trying to knock him off the ball was a futile exercise. He was worth the £32.5 million that Brendan Rodgers' Liverpool paid for him in 2015, and Aston Villa subsequently finished bottom of the Premier League table without him. Just over four years later, each mishit shot or wayward header seems to weigh on him like a personal insult. He looks beaten. Unfortunately for Crystal Palace, their striking issues are much more deep-rooted than just Benteke's flaccidity. It was three years ago that Connor Wickham managed a decent run of starts. Alexander Sorloth has been a poor signing, but that can't be much of a surprise when he was signed off the back of five goals in 42 Eredivisie appearances for FC Groningen. Jordan Ayew's loan from Swansea City has been predictably underwhelming. Wilfried Zaha is one of the best wingers in the division but regularly finds himself in a front two with Andros Townsend, another player who is better out wide. Only Huddersfield Town have scored fewer goals than the Eagles this season. To further compound the misery, Crystal Palace are now underperforming in defense as well after hemorrhaging six goals against Brighton & Hove Albion and West Ham United. Unless Roy Hodgson finds a system that correctly utilizes his talented squad soon, Palace will go down. James Tomkins - arguably Crystal Palace's best signing since getting promoted under Ian Holloway in 2013 - was uncharacteristically poor in those outings. His partner in the middle of the backline, Mamadou Sakho, was also off the boil, performing just one tackle across the two matches. While their performances are a little concerning, they are anomalies; two games ago Palace had the sixth-best defensive record in the division, conceding one fewer goal than Arsenal (who at that point were 10 positions higher than the Eagles in the table) and six fewer than Manchester United. Either side of the back-four, Palace have two of the better full-backs outside the top six in Patrick van Aanholt and Aaron Wan-Bissaka. Higher up the pitch is where the problems lie. Hodgson seems reluctant to shift from a 4-4-2 system with a narrow midfield, which only serves to benefit his regular central midfielders - captain Luka Milivojevic and Cheikhou Kouyate - and full-backs due to the free channels ahead of them. 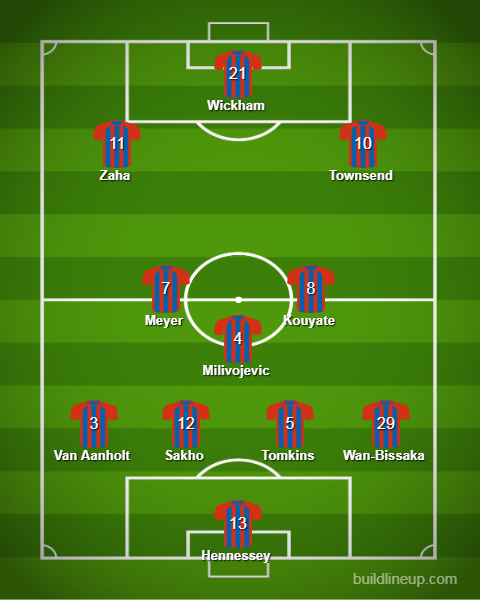 Zaha and Townsend, meanwhile, are out of position, while the likes of Max Meyer and James McArthur have looked awkward as the wider midfielders. Getting the best out of Meyer should be a priority. He's possibly the most gifted technical player on Hodgson's roster but needs to be fielded in a position that makes the most of his vision and doesn't expose his lacking speed. Domenico Tedesco drew the best form out of Meyer by playing him deeper in Schalke's midfield as a regista, where his knack of maintaining possession came to the fore. He may lack some physicality, but Palace already have plenty of that through the middle from Milivojevic and Kouyate. Meyer can bring a different dimension to a side that has tended to punt the ball down the flanks for years. The rest is obvious: Zaha and Townsend must play on the wings where they are at their most devastating. Then there should be a focal point, someone who is not necessarily a prolific scorer but who can recycle possession and hold up the ball. For now, that duty should be left for Wickham, who is returning to fitness. The Ipswich Town product helped pull off a survival act for Sunderland with a scoring outburst near the end of the 2013-14 season. If, somewhat inexplicably, Crystal Palace cannot be better than three other Premier League teams in the above system, they will have to recruit in attack. It would be understandable if Hodgson isn't entrusted with the savings account - signing Meyer for nothing doesn't compensate for acquisitions such as Erdal Rakip, Jaroslaw Jach, Sorloth, and Ayew - and the departures of Glenn Murray and Dwight Gayle before he took over reflects badly on the overall regime's transfer strategy. Both would present huge upgrades on what Crystal Palace currently have. Unless, that is, Benteke can return to his uncontainable best. When Alan Pardew signed the striker from Liverpool in 2016, he purchased a player who should have been perfect as Crystal Palace's attacking spearhead, where he would be ably flanked by Zaha and Townsend. Unfortunately, Benteke, like his club, is currently a faded version of what he could be.